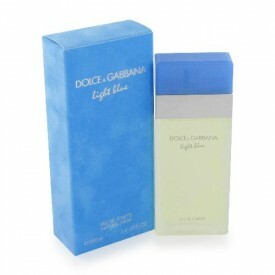 Launched in 2001, Light Blue by Dolce & Gabbana perfume is a casual and breezy, sparkling fruity-floral scent that evokes the spirit of the Sicilian summer. Mouth-watering notes of lime and cedar bring about an image of the South woods on the seashore—making it the perfect blend for a hot summer day. The fresh scent is housed in a stunning rectangular-tiered bottle with light-blue cap.